In the far right distance, it may look as if a line goes off to the left. But in fact it is a mark on the print, and the line actually goes straight on out of the picture. Ted says "It certainly mystifies me!" 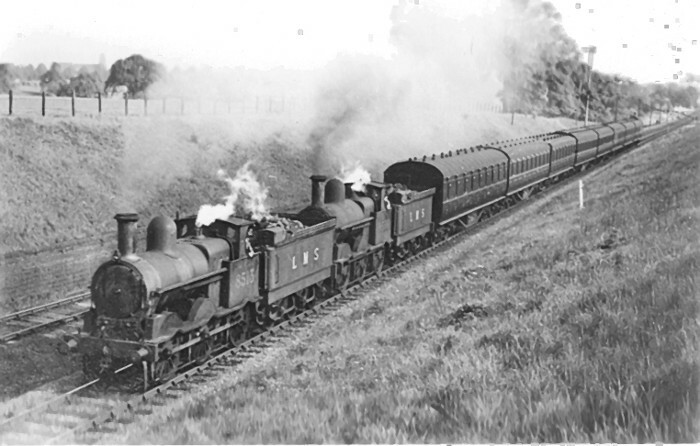 This is a train from Leamington heading north for Kenilworth, Coventry and (probably) Nuneaton. The retaining wall visible on the east side was placed there when this part of the line was doubled in 1883, and the up and down tracks are spaced wider apart to pass under what were originally single-arch bridges at the village of Old Milverton. At a guess, the milepost might be 8 miles from Coventry. The date is probably circa 1938. The route is "miled" from a zero at Milverton [towards Coventry] - Paddington via Didcot mileage ending there, and re-starting at zero. Also this is part of the line that needs to be re-doubled, to allow the Reading to Newcastle Cross Country trains to be diverted via Coventry! Interesting, Peter. So that milepost must be three-quarters of a mile north of zero at Milverton. And it does look like a square-topped 3/4 post. But I think - at least in L&NW and LMS days - that this mileage system would have followed on from the series of posts on the 15-mile line from Rugby through Leamington to Milverton, rather than from the GW. Regarding the mileages, there was a zero datum at Warwick (Milverton) as far back as the nineteenth century. For some reason the mileage from Rugby via Marton finished there, and at 15m 12c from Rugby there was a new zero with mileages to Coventry being measured from there. Careful study and measurement from the "MP" marked on the 1st and 2nd Edition OS maps confirms this. There must be some historical reason for this, but it is not clear to me right now! Of course, this is long before - and nothing at all to do with - the direct junction from the GWR line which was only commissioned in 1966! I'm guessing, but when the Coventry to Milverton line opened in 1844, maybe its mileposts ran from Milverton 'up' to Coventry. When the line from Rugby through Leamington was added in 1851 the normal system of counting distances from the main line had become established. For a time Milverton seems to have been regarded as the terminus of each line, but if they'd started from zero at Milverton in both directions it would have complicated the counting of mileages along the entire loop from Rugby to Coventry. So why didn't they simply change the mileposts between Milverton and Coventry? The whole line could then have run from zero at Rugby to 23.75 miles at Coventry. But perhaps all those new posts and their re-positioning would have been regarded by the L&NWR as a needless expense.